Peterborough Sports boss Chris Plummer. Peterborough Sports chief Chris Plummer admits he will be disappointed if the city club miss out on promotion . . . even though they are exceeding ChromaSport & Trophies United Counties League Division One expectations. Sports are one of five teams who appear to be scrapping over the second promotion spot behind table-topping Northampton Spencer – a side two points clear with a stack of games in hand. Sports currently sit second but face a tough run-in. 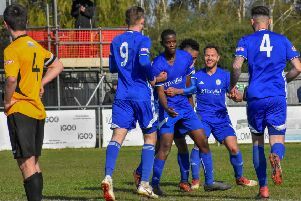 Eight of their remaining nine games are on the road, starting with a trip to fourth-placed Wellingborough side Whitworths on Saturday. Plummer said: “If we had been offered this position at the start of the season, we would have gladly taken it. “But promotion is almost within touching distance and it would be a something of a disappointment not to make it from here. “It is up to myself, my management team and the players to finish the job in the final few games. “It certainly won’t be easy with so many away games and it is far from ideal how the fixtures have worked out. “There is no point moaning about it though. “We just need to focus on the job in hand, take things one game at a time and look to pick up the results we need. “We cannot afford to lose on Saturday to another side involved in the shake-up with us. “I fully expect Northampton Spencer to win the league from here. “They are the best team in the division and have beaten us twice. Sports haven’t played since recent striking signings Ash Stevens and Karl Gibbs fired them to a 2-0 win at struggling Blackstones just over a week ago. Their away game at Bugbrooke last Saturday was postponed.